Database for Questions & Answers: Power on Board. 1. 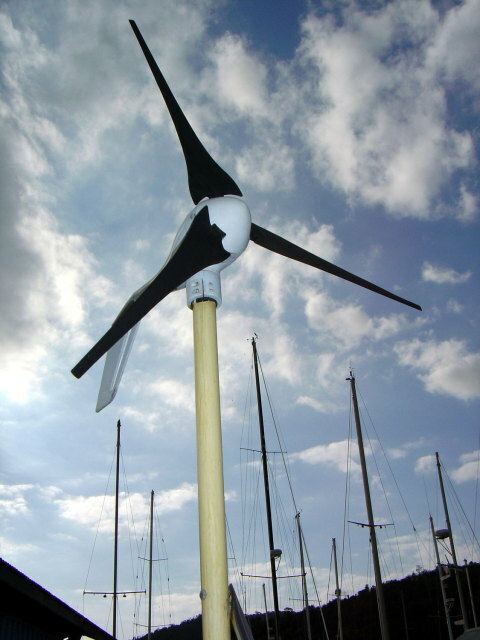 I have priced a 90 watt wind generator (10 m/s), this is little compared to youers, what do you think? 2. I dont have much on the boat that draws power, maybe 25 Amps. I have a 56 watt solar panel. Is this good? 1. Wind generator. i have a wind genny that i try not to use. The day i have enough (i my dreams) power i will try to sell it. The most important thing for me with the genny is that it is quiet. Many of them make a lot of noise and it is not fun for you or the other people on the anchorage. Personally i would like to have a Rutland. They are quiet and give some power. It is also important that it can give power with little wind and the Rutland do. The one i have is giving a lot of amps but it requires a lot of wind. If i am sailing with the wind (we all try to do this as often as we can) it almost never spins. Regardless of what people think of wind generator, they are very efficient, work 24 hours in rain and in cloudy conditions. Whenever there is overcast and youer solar panels don't give much the wind generator will keep working. If i were to buy a new one i would get one that gives about 2 amps in low wind and don't make a lot if noise. - Ordinary led batteries (with water) should not be used more than 50% of the rated power. By this i mean that if youer battery is rated at 100 amp. hours you can only use 50 amps before you have to recharge. - To find the status of youer battery you use a volt meter. A fully charged battery (that has been left with no charge or load for one hour) can have a charge of up to 12,7 volts. If it has 11,7 volts it is broken. If you measure while under way and you have 12,2 volts you have used half the power. You HAVE to recharge at this point. Below 12,2 volts the battery starts a sulfating process and the plates inside will destroy itself. (This is not something you can recharge). However you have to try and fail a bit because you seldom have the opportunity to do a good measurement while under way, something is always charging or drawing so it is hard. teks. if you just used 5 amps for something the battery might show 12,2 volts but be on its way back up again and ten minutes later it can show 12,5. - If you buy New batteries buy the same brand, never, never hook a new battery up together with an old one, the old one will kill and bring the new one down to its 'old' level very fast. - Gel batteries are of course the best, they can take more charge and more discharge but are expensive. Deep cycle batteryes are almost the same but a little bit cheaper. As i said this is the best but they cost the doble of led batteries. To know what kind of charging devices you need first you need to know how much power you use. 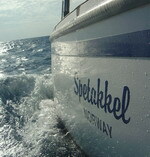 S/Y Spetakkels power accounting (24 Houers). As you can see my usage is mostly for the computer since it takes more than 50% . I should have purchased a more power friendly computer. This 'budget' is at anchor and only an exampel. Include everything when you make youer own and make one for anchor and one for sailing. As mentioned this is only for example. Remember that you have to have twice as much power as the result in battery capacity since you can only use half the rated power. 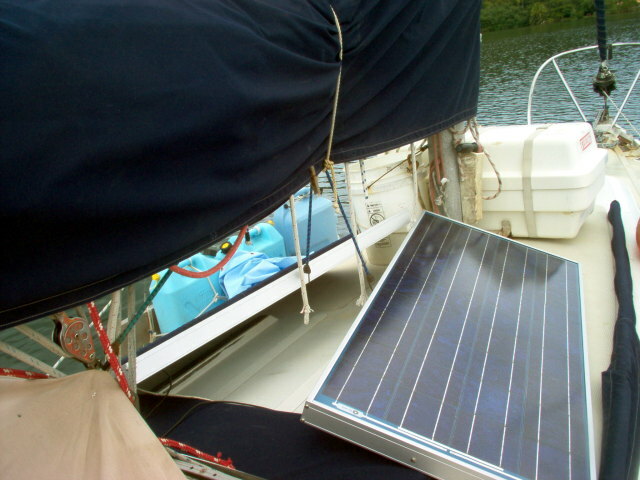 The truth is that most boats are struggelign to get enough power. Roughly one can devide the sailors in two seperate groups. Those who have a fridge and need to run the engine or generator for two houers a day and those who dont have a fridge and still are struggeling to avoid engine usa. Youer solar panel of 56 watt is good. Nothing is better than solar power. Remember to keep the regulator on the inside and use big cables between the panel and the batteryes. It is foolish to loose power in transport.